Showcase your own model car build-up! Send us a picture of your model car along with a short description including which Gofer Racing decal sheets and the model kit you used. Dave Van who many of you know and who has helped Gofer Racing Decals with some design work was nice enough to send me a picture of one of his recent builds. He built a Lindbergh trailer and used The Mason and Dixon decals from Gofer Racing's decal sheet 11052 Yesterdays Trucking. Thanks for supporting The Gofer. Glenn Hurd built this neat NASCAR model of Dave Marcis 1980 Oldsmobile using Gofer Racing decal sheet 12008 Dave Marcis/Buck Stoves. For the plastic he used the new Salvino JR Model kit Gray Ghost. Thanks for the picture and I appreciate your support of Gofer Racing Decals. Frank Hankins of Indiana sent us this picture of his 1975 Mustang slot car racing dragster. He used Gofer Racing Decals sheet #11003 New Flames to accent his car. Frank says he is an enthusiastic model car builder and slot car racer. Go get 'em Frank. 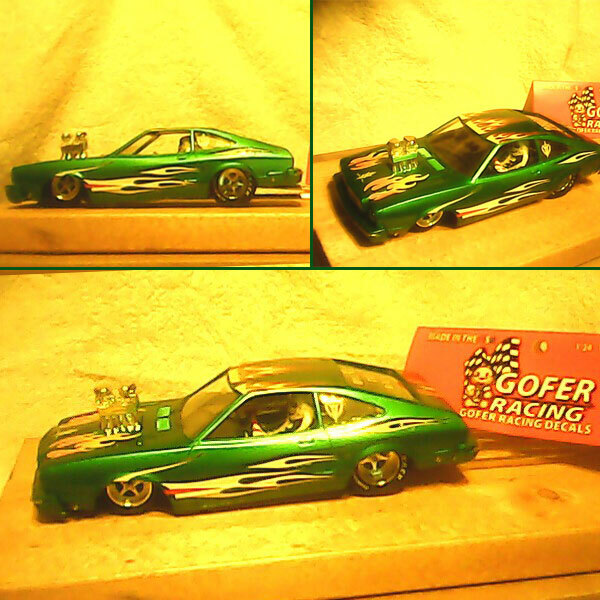 Here are the first two models that have your Gofer Racing license plates decals (stock # 11001) on them. I've gotten a lot of compliments on them. P.S. I owned a van exactly like the one in the pictures and the Corvette is my dream car. This model car was built by Wes Hurst using a Revell Match Racer and he used Gofer Racing Decals for his gauges, sponsors and contingency sponsors. These model cars were built by Rick Anderson using a Lindberg kit and he used Gofer Racing Decals for hometown sponsors, numbers and our stuff sheet #1. This model car was built by Mark Blankenship using a Model Kings 1972 Monte Carlo and he used Gofer Racing Decals for his car numbers, sponsors and contingency sponsors decals.